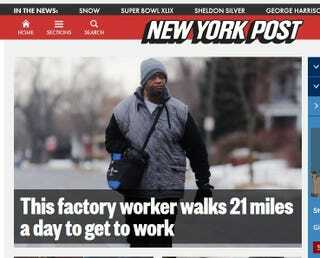 Yesterday morning I posted a piece about James Robertson, the man who walks 21 miles a day as part of his to and from work commute. His home is in Detroit and the Detroit Free Press ran the original article. I asked the question about raising some money for him and a gofundme account was set up shortly after. Can&apos;t We Get This Man A Car? It looks like that account is going to break $60,000 soon, largely because the media around the world has heard the story of James and of the outpouring of generosity from strangers who wanted to help. I saw the story on CBS national news and have heard that it was on CNN and a number of other outlets. It is also in the print media. Please note that James did not seek any help but he is grateful that it was offered to him. I will post more follow ups as the story develops. I have been corresponding with the man who is running the gofundme campaign. Here is the follow up piece from today's Freep. And for the sake of disclosure, I will tell you I delivered the Free Press when I was a kid. What a nightmare. Getting up at 5 a.m. and delivering those papers every day before school. I must have walked a mile or two. Hurts just thinking about it. I was so glad when I got older and finally got a job where I didn't have to walk so much.